Jack Baldwin should return for Posh against Coventry. Photo: Joe Dent/theposh.com. But he’s still predicting two talented teams will deliver a TV spectactular. Adam Armstrong scores the winning goal for Coventry against Posh earlier this season. Photo: Joe Dent/theposh.com. Sky television chose this match for live coverage when both teams were in the top six, but both have seen their form collapse since then. International call-ups have also ravaged the squads, but Westley believes there will still be plenty of exciting players on display. 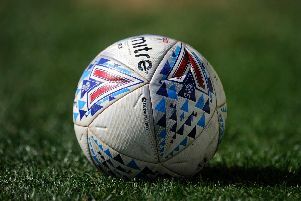 Posh have five players - Harry Toffolo, Martin Samuelsen, Kgosi Ntlhe, Gaby Zakuani and Michael Smith - away on international duty, while Coventry will be without star men Adam Armstrong, James Maddison and Jack Stephens for the same reason. “It won’t be the game Sky thought they were getting, but it will be a competitive one,” Westley stated. “My players put on the best training session I’ve seen in my time here on Tuesday (March 22) so I know they are in great form. “The football they produced was fantastic and I’m confident we will play well. “The television cameras don’t put players off these days. Every game and every goal is shown on television so players won’t be fussed by a live TV audience. “The last time we were on TV, against West Brom in the FA Cup, we were very good. So good in fact Barry Fry (director of football) said it was the best display he’d seen in his 20 years at the club. “We were without Michael Smith and Ricardo Santos that night as well and they had been flying. “We are missing some good players tonight, but we still have many good ones to select from. “Coventry are missing some strong peformers as well, but they are a big club with a big squad and a top manager so they will be very competitive. Their replacement players will want to show what they can do as will mine. “The first game this season between the sides saw the best and worst of us as we were 2-0 up at half-time, but lost 3-2. Posh central defender Jack Baldwin is expected to return to the starting line-up after missing last weekend’s (March 19) win at Doncaster. He may play right-back with Ricardo Santos starting in the centre of defence alongside Michael Bostwick. Andrew Fox is favourite to start at left-back.